The best! Leaves a pleasant tingle when rinsed out. A family favorite. My kid has us send bottles to him in college. I bought this not really looking for anything special, but thought It would work well. Turned out I love this shampoo and it just does wonders for my hair. I ran out and my hair has not been happy with any other shampoos I’ve used these past two months. I plan on buying more, leaves me feeling so clean and fresh and a clean “minty” feel if that makes sense? Absolutely got rid of my dry scalp. I’ve been using this shampoo and conditioner for many years. I love the tingle you get from the shampoo and it rinses out very smooth. It is very important to me that you don’t test on animals. I always bought this locally, but target stopped selling it. I tried buying it from Amazon once, until I realized they are not authorized dealers. Between the sale price, the coupons and the free shipping I received a better deal directly from you and I know the product is fresh and the real deal. I also liked all of the products that I received as free samples. Shipping was fast and customer service is helpful. I have been using Giovanni products for many years.This tea tree shampoo is the best in treating any sort of scalp issues.I stopped using it for a few months and my scalp issues returned.I purchased locally from Natures Pantry who I found had the full line of Giovanni products.I have gone back to this since last week.With daily use it should be life saver for my scalp issues. Have been using this shampoo for years! 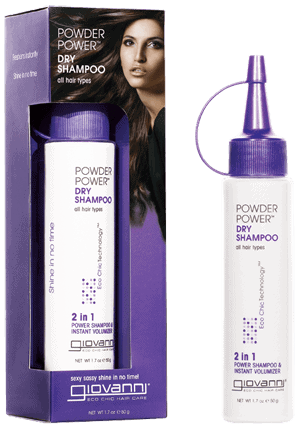 Leaves my hair feeling great, without the harsh smells of other shampoo’s! I buy it a gallon at a time! Thanks for creating such a great product!